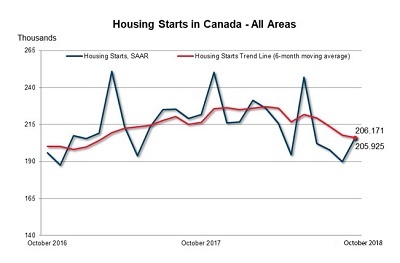 The trend in housing starts was 206,171 units in October 2018, compared to 207,809 units in September 2018, according to Canada Mortgage and Housing Corporation (CMHC). This trend measure is a six-month moving average of the monthly seasonally adjusted annual rates (SAAR) of housing starts. Housing starts in the Vancouver Census Metropolitan Area (CMA) trended lower in October 2018 as fewer projects in both the single-detached and multi-family sectors got underway across the region. Construction activity for the month was concentrated in the City of Vancouver, which accounted for over half of all starts with several major projects. With the resale home market softening over the course of 2018, new home construction for the year is on track to be slightly below the total for 2017. Metro Victoria housing starts trended lower in October, bringing year-to-date totals six per cent below the record-setting level of 2017. The year-over-year changes in October housing starts are large, due to the timing of major apartment projects. The trend in housing starts remains elevated overall. The housing starts trend in Calgary decreased in October from last month. The pull back in new construction was largely driven by lower apartment starts, as inventory levels for apartment units remain elevated. However, on a year-to-date basis, total housing starts in October were three per cent above last year at this time. The trend measure of housing starts rose in October after local home builders increased production of apartment units. Nonetheless, the overall pace of new home construction in Regina is significantly below last year’s level, especially in the single-detached sector where elevated new inventory has slowed production. Multi-family construction through October was down by 34% compared with the same period of 2017. Total housing starts trended higher in October on the heels of strong multi-family dwelling starts. Strong pre-construction sales of more affordable townhomes and condominium apartments over the past two years continue to lead to housing starts in 2018. Meanwhile, the downward trend in single-detached home starts continued through October to its lowest level this year, mirroring the slowdown in their pre-construction sales over the past 12 months. Rising cost of land and lack of serviceable land have hampered new sales centre openings in recent years, thus resulting in fewer starts. The trend measure of housing starts moved lower in October by nearly 10%. This month’s pullback was a result of fewer apartment projects starting and the continued slowdown in single-detached starts. The number of single-detached homes completed and unsold has trended up in 2018, which is likely resulting in fewer starts as builders can satisfy a portion of demand from existing inventories. The trend in total housing starts stood at a five-month high in October. The pace of new residential construction increased for both single-detached and multi-unit dwellings. One third of the total starts were rental apartments. Currently, all apartments under construction are purpose-built rentals, and represent 35% of total units under construction. Declining vacancy rates encouraged builders to build more rental units. Total housing starts in the Montréal area since the beginning of 2018 show a very slight increase. The aging of the population continues to fuel seniors’ housing construction. The relatively low vacancy rates on the rental market also stimulated the construction of rental units in the metropolitan area. Housing starts in the Trois-Rivières area trended higher in October 2018. Condominium and rental housing construction accounted for this growth, including the start of construction on a 118-unit seniors’ housing project. The decrease in the inventory of unabsorbed new condominiums along with employment growth contributed to supporting the need for new units in this market segment, while the aging of the population continued to stimulate demand for seniors’ housing. The standalone monthly SAAR of housing starts for all areas in Canada was 205,925 units in October, up from 189,730 units in September. The SAAR of urban starts increased by 8.6% in October to 191,964 units. Multiple urban starts increased by 16.8% to 145,442 units in October while single-detached urban starts decreased by 10.7% to 46,522 units.